This tutorial explains how to add notes to Google Keep from Google Docs. 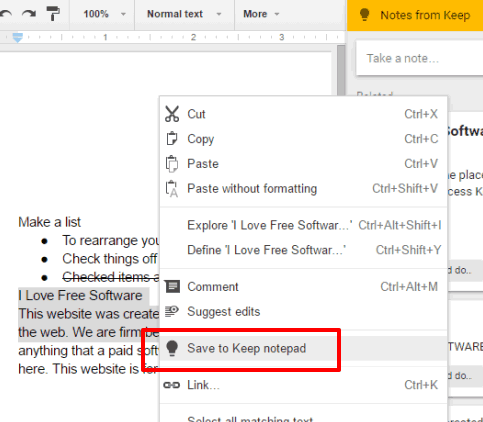 You can open any Google Docs document and then select the text of that document to save it as note in Google Keep. The best part is that you don’t need to install any Google Docs plugin or follow other complicated steps. Google has added an option in Google Docs using which you can access your Google Keep notes. 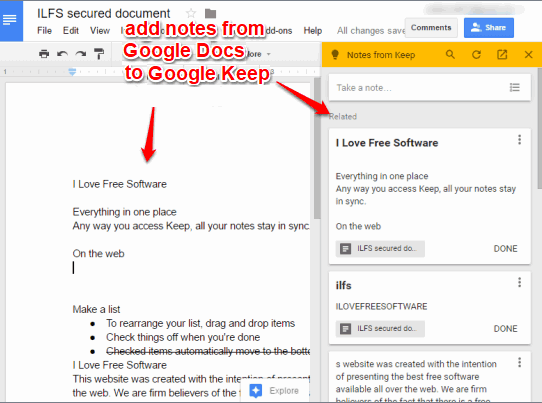 So it becomes really easy to add notes to Google Keep from any Google Docs document. 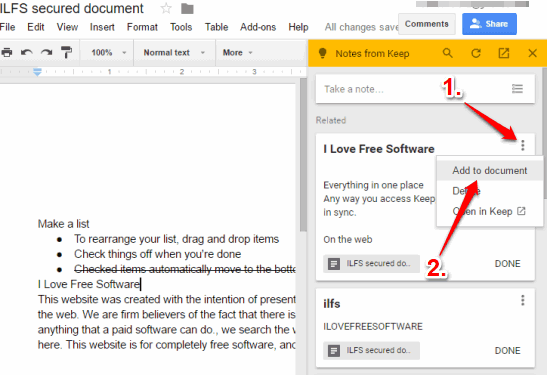 Your Google Keep notes are visible in a right sidebar on a Google Docs document. When the sidebar is visible, you can select the text available in your document and add it to Google Keep using the right-click context menu. Another interesting feature is that you can also add notes from Google Keep using that sidebar to your Google Docs document. Above you can see the sidebar where Google Keep notes are visible and a Google Docs document from which I added a note to Google Keep. 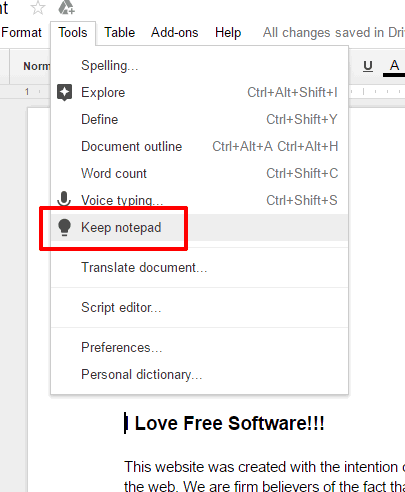 How To Add Notes To Google Keep from Google Docs? Step 1: Login to your Google account and then open a Google Docs document. If you are opening a Google Docs document for the first time since this feature is introduced, then you will see a pop-up like visible in the screenshot below. Step 2: Open Tools menu and then you will see a new “Keep notepad” option. Click on that option. Step 3: You will automatically connect with your Google Keep account (as you have already logged in to your Google account) and a sidebar will be visible on the right side. In that sidebar, you will see all your Google Keep notes. You can use that sidebar to create new notes, edit any note, delete a note, etc. You can select some text, copy it, and then manually paste it in “Take a note…” section available in Google Keep sidebar. Select some text, then access right-click menu and click Save to Keep notepad option. This will save the selected text in Google Docs as a note in Google Keep. This way you can add as many notes from Google Docs to Google Keep as you want. Manually copy a note from and then paste it in the preferred place. Using this option, only the note is pasted and not the title. Drag a note and drop it to a particular area in your Google Docs document. This will add that note along with its title in your document. Click on Menu icon (three dots) available for a note and use “Add to document” option. This option also adds the note and its title in the document. This is how easily you can add notes to Google Keep from Google Docs and vice-versa. You can also learn How To Post From Google Docs To WordPress and How To Add Audio Comments in Google Docs Documents. 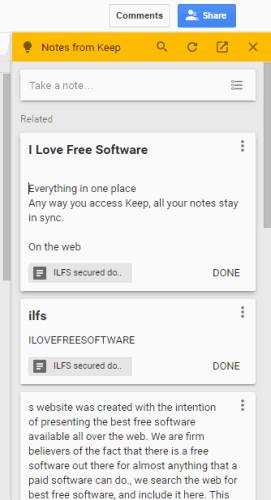 Earlier we first had to open a Google Docs document separately, then copy a particular text from Google Docs, open Google Keep, and finally we can paste the text as a note in Google Keep. This process becomes easier as we can access Google Keep notes directly in a document of Google Docs. 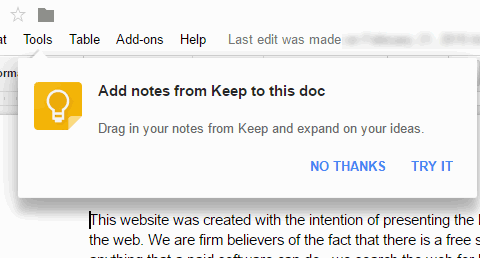 The option to add notes from Google Keep to Google Docs makes this feature more useful.